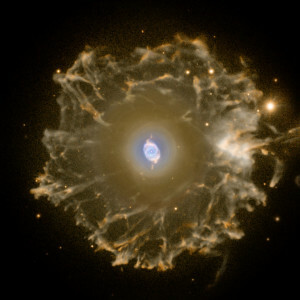 The Cat’s Eye Nebula is a famous planetary nebula located in the northern constellation Draco. The nebula’s designation in the New General Catalogue is NGC 6543. 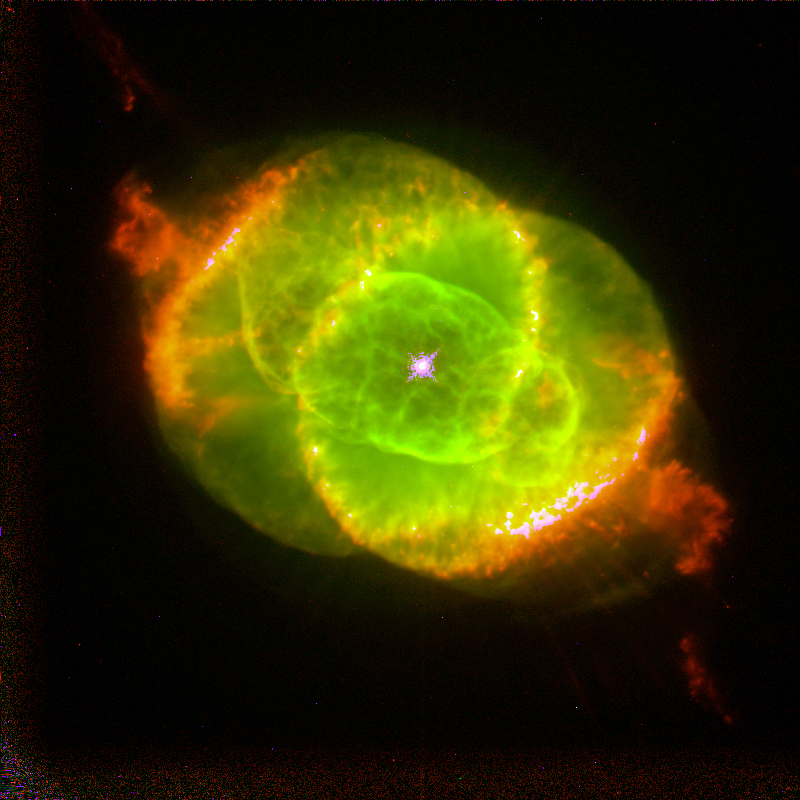 The Cat’s Eye is one of the most structurally complex nebulae known. It was formed around 1,000 years ago when a hot, bright central star expelled its outer envelope. NGC 6543 is sometimes also known as the Sunflower Nebula or the Snail Nebula. It lies at a distance of 3,300 light years from Earth. 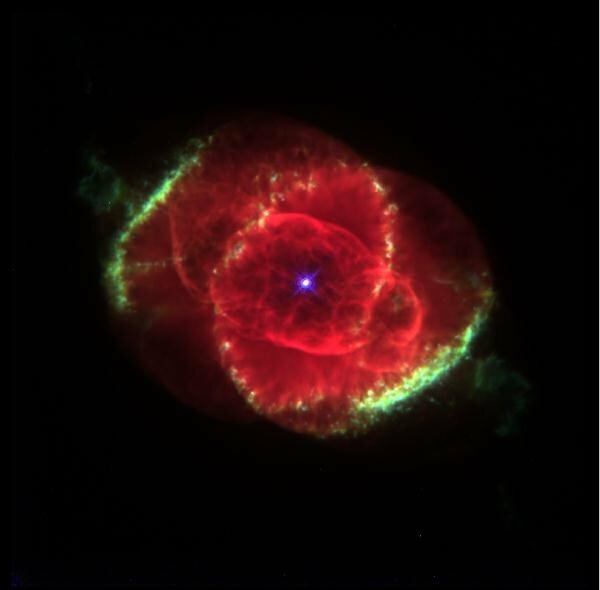 The Cat’s Eye Nebula is easy to observe from northern latitudes as it is located almost exactly in the direction of the North Ecliptic Pole. The nebula appears as a diffuse blue-green disk crossed by an s-shaped brown curve, with an intricate circular structure at the inner region. The nebula’s core has an apparent size of 20” and a high surface brightness. 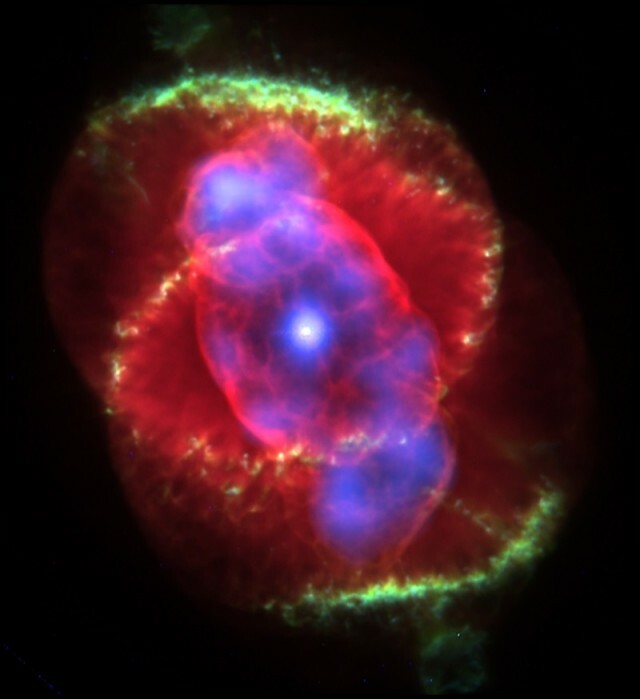 The Cat’s Eye Nebula consists mainly of hydrogen and helium, with smaller quantities of heavier elements. It was one of the first planetary nebulae to be discovered. The central progenitor star is an O7 [WR]-type star, about 10,000 times brighter than the Sun and with a radius only 0.65 times solar. The star has a temperature of about 80,000 K. It is losing around 20 trillion tons of mass per second in a fast stellar wind, or 3.2×10−7 solar masses per year. The star is believed to have originally had a mass of around 5 times solar. The stellar wind has a velocity of around 1,900 km/s. The Cat’s Eye Nebula is expanding at a speed of 16.4 km/s. Its angular expansion rate is 3.457 miliarcseconds per year. NGC 6543 was discovered by the German-born British astronomer William Herschel on February 15, 1786. Herschel compared the nebula’s appearance to that of the disk of an outer planet when seen through a small telescope, which is how planetary nebulae got their name. The English amateur astronomer William Huggins studied the nebula’s spectrum on August 29, 1864 and showed for the first time that planetary nebulae contain hot gases, but not stars. 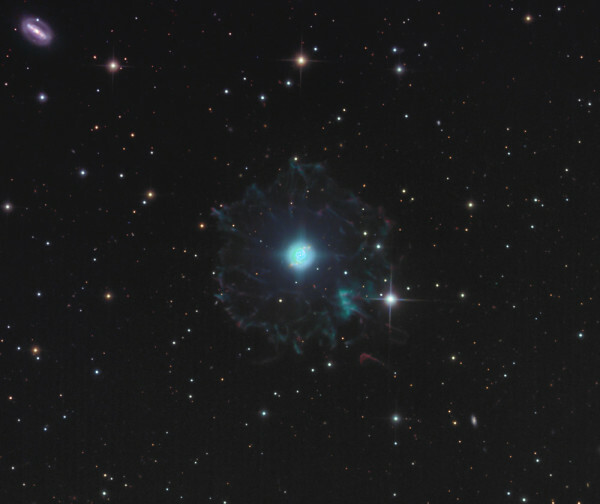 The Cat’s Eye was the first planetary nebula to be studied with a spectroscope. It has since been observed across the full electromagnetic spectrum, from infrared to X-ray. The Cat’s Eye Nebula has a complex, intricate structure which includes knots, bubbles, concentric gas shells, and jets of gas, as seen in hi-res images taken by the Hubble Space Telescope in 1994. The nebula’s structural complexity may be the result of material being expelled from a binary central star, but the existence of a binary companion has not yet been directly confirmed. The bright inner region of NGC 6543 is relatively small, with the major axis of the inner ellipse spanning only 16.1 seconds of arc. The distance between the condensations is 24.7 arcseconds, and the nebula’s extended halo has a diameter of approximately 386 arcseconds, or 5.8 arcminutes. The extended halo, which has a temperature of about 15,000 K, consists of matter that the central star expelled in its red giant stage. The temperature of the main body of the nebula is between 7,000 and 9,000 K.
The brightest of the knots in the nebula’s halo was discovered by E.E. Barnard on April 24, 1900. The knot has its own entry in the IC catalogue: IC 4677. The structure of the bright central region is a result of the fast stellar wind from the central star interacting with the material expelled when the nebula was formed. The wind has ‘hollowed out’ the nebula’s inner bubble and burst it at both ends. 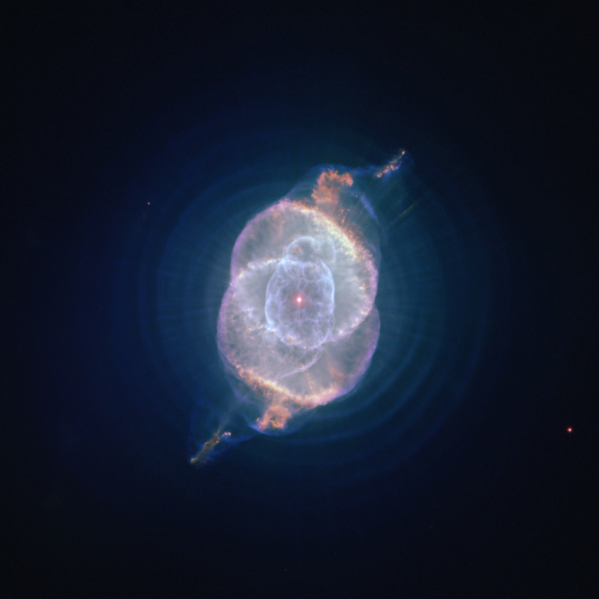 The Cat’s Eye Nebula has a series – eleven or more – of concentric, evenly spaced rings outside the central region. The rings are believed to have been ejected before the progenitor star ejected its outer envelope, forming the nebula. The pulsations that resulted in the creation of the rings are thought to have started some 15,000 years ago and stopped when the central part of the nebula was formed about 1,000 years ago. The nebula’s large extended halo was also created before the main nebula. The halo as a mass between 0.26 and 0.92 times solar. 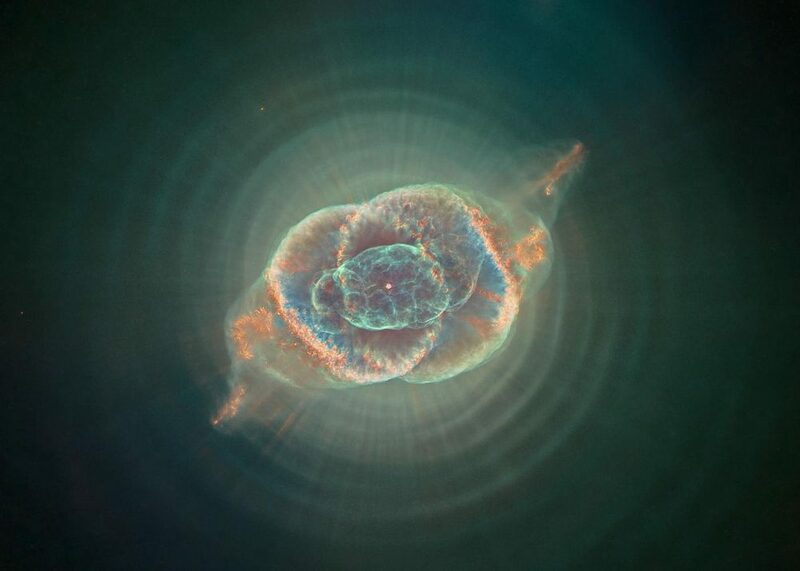 An X-Ray image of NGC 6543 has revealed a bright central star surrounded by a cloud of multimillion-degree gas in the planetary nebula known as the Cat’s Eye Nebula. 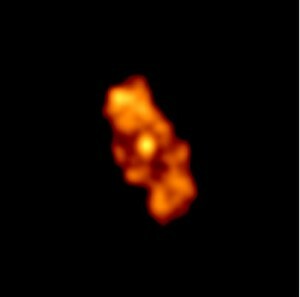 This image of the Chandra X-Ray Observatory, where the intensity of the X-ray emission is correlated to the brightness of the orange coloring, captures the expulsion of material from a star that is expected to collapse into a white dwarf in a few million years. The intensity of X rays from the central star was unexpected, and it is the first time astronomers have seen such X-ray emission from the central star of a planetary nebula. The ACIS X-ray camera aboard Chandra observed NGC 6543 from May 10-11, 1999 for a total exposure time of 46,000 seconds. Image: NASA/UIUC/Y.Chu et al. The Sun may end its life in similar fashion in about five billion years, first expanding into a red giant with a diameter about 100 times greater than it originally was, then expelling its outer layers into space, with the hot central core emitting ultraviolet radiation into the surrounding clouds of gas, and causing them to glow. The mechanism responsible for the shape of a planetary nebula remains unclear, but various theories suggest that it may be the progenitor star’s magnetic field or a companion star’s gravitational force that is affecting the expelled gas. The exact mechanism that caused the stellar material to be ejected at the intervals required to form the concentric rings around the Cat’s Eye is not known yet either. Pulsations that result in formation of planetary nebulae typically take place at intervals of tens of thousands of years, and smaller surface pulsations occur at intervals ranging from years to decades. Observations of the Cat’s Eye Nebula indicate that the central star expelled its mass in a series of pulses occurring at 1,500-year intervals, creating concentric shells of dust around the dying central star. 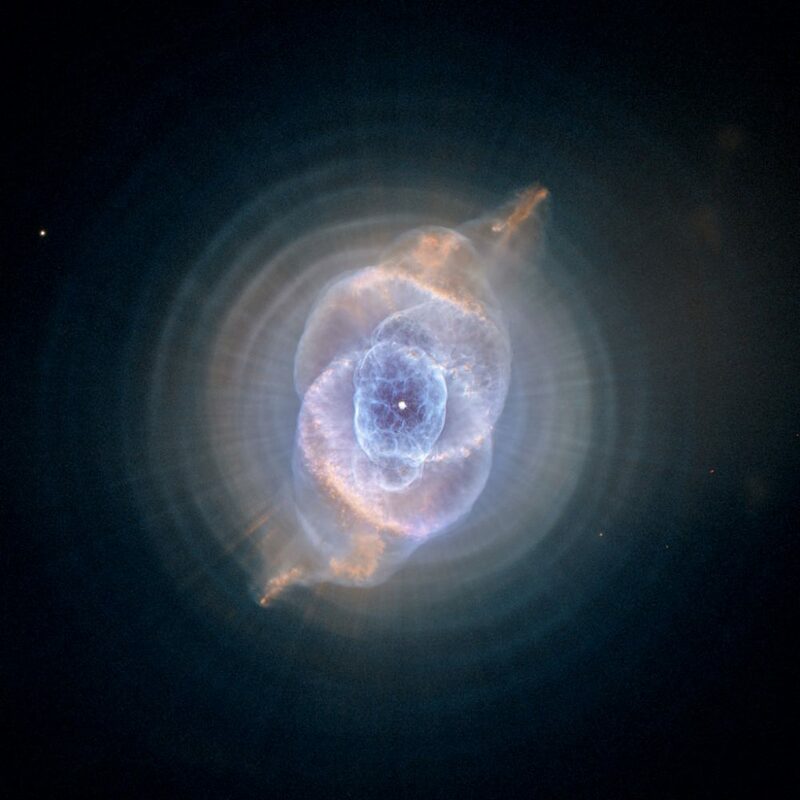 The Cat’s Eye Nebula will gradually disperse over the next several thousand years and the progenitor star will eventually cool down and become a white dwarf. 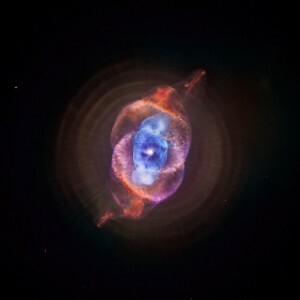 This NASA Hubble Space Telescope image shows one of the most complex planetary nebulae ever seen, NGC 6543, nicknamed the “Cat’s Eye Nebula.” Hubble reveals surprisingly intricate structures including concentric gas shells, jets of high-speed gas and unusual shock-induced knots of gas. Estimated to be 1,000 years old, the nebula is a visual “fossil record” of the dynamics and late evolution of a dying star. A preliminary interpretation suggests that the star might be a double-star system. The suspected companion star also might be responsible for a pair of high-speed jets of gas that lie at right angles to this equatorial ring. If the companion were pulling in material from a neighboring star, jets escaping along the companion’s rotation axis could be produced. These jets would explain several puzzling features along the periphery of the gas lobes. Like a stream of water hitting a sand pile, the jets compress gas ahead of them, creating the “curlicue” features and bright arcs near the outer edge of the lobes. The twin jets are now pointing in different directions than these features. This suggests the jets are wobbling, or precessing, and turning on and off episodically. This color picture, taken with the Wide Field Planetary Camera-2, is a composite of three images taken at different wavelengths. (red, hydrogen-alpha; blue, neutral oxygen, 6300 angstroms; green, ionized nitrogen, 6584 angstroms).